LOS ANGELES, CA – Senior right-hander Garett Claypool (3-0) recorded nine strikeouts in 6.2 innings, and three Bruin relievers combined to throw 2.1 hitless frames, leading the No. 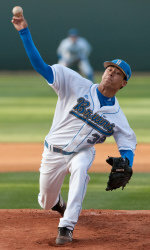 6 UCLA baseball team past Pepperdine, 2-1, on Tuesday evening at Steele Field at Jackie Robinson Stadium. The victory pushed UCLA’s historic season-opening win streak to 21 games. Claypool limited the visiting Waves (8-15) to one unearned run and two hits in extending UCLA’s record to 21-0. Right-hander Dan Klein notched his team-leading fifth save, striking out the side in order in the top of the ninth. Pepperdine left-hander Aaron Gates (1-5) allowed two runs and five this in 7.2 innings, striking out eight batters and issuing one walk. Gates absorbed the loss despite holding UCLA to its fewest runs and hits in a game this season. UCLA scored its two run in the bottom of the fifth, taking advantage of two key bunt singles to secure a 2-0 lead. With runners aboard first and second base, catcher Trevor Brown bunted safely down the third-base line to load the bases with nobody out. Center fielder Chris Giovinazzo reached on a fielder’s choice, sending home first baseman Dean Espy from third. A bunt down the first-base line by third baseman Cody Regis plated left fielder Cody Keefer. Pepperdine scored one unearned run in the top of the seventh on a sacrifice fly to center by pinch-hitter Ryan Henry, allowing third baseman Colin Rooney to score from third base. One at-bat earlier, Rooney had advanced to third base on a base hit after Keefer slipped and fell while fielding a ground ball near the left-field line. Left-hander Matt Grace threw one scoreless frame in relief of Claypool before right-hander Erik Goeddel made one pitch to induce a flyout to right field, ending Pepperdine’s half of the eighth inning. UCLA (21-0) opens Pac-10 play at home against Stanford (12-7, 2-1 Pac-10) on Thursday, April 1. Game time of the series opener Thursday is for 6 p.m. The Bruins and Cardinal continue their series Friday at 6 p.m. and Saturday at 2 p.m.